From the kitchen of One Perfect Bite...This brunch pizza is a study in wretched excess. It is also delicious and will make any late morning meal special. The pizza is loosely based on one that was developed by Wolfgang Puck and served as part of a holiday brunch at Postrio, one of his restaurants. The idea of pizza for breakfast or brunch may be off-putting to some, but if you look at the ingredients used here, I think you'll be pleasantly surprised. While smoked salmon and caviar aren't everyday foods, the components of this dish are really breakfast items that are served in a slightly different way. I've simplified the original recipe and eliminated making the pizza crust. I use pocketless pita bread as the base for the pizza and it works quite well. 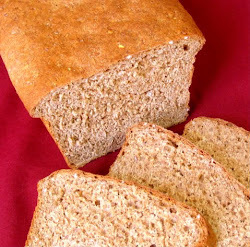 It makes life much easier, but if you'd like to see the original recipe you can find it here. This wonderful dish is easy to make and I have only one caution to share with you. Do not over cook the eggs. They should be barely set when spread on the pizza base. They will continue to cook in the oven and they'll be rubbery if they are overdone. I know those of you who try this brunch-style pizza will love it. Here's the recipe. We'll not talk of cost. Such an interesting idea! I would love to try this. Espectacular receta y preciosas fotos. Un blog muy tentador. Decadent, I could happily eat this on a regular basis! Looks sensational! I love how you are so creative in your posts, as well as your obvious culinary expertise. This, however, looks like much more than ONE PERFECT BITE. Excellent, I never tried but I'd sure like it! Next brunch I'm hosting, I'm trying this pizza! This is the most decadent little pizza - yum! Not offputting to me, I would love to have a slice of pizza for brunch! Hot stuff! That's a kind of brunch I could REALLY get into. Well done! Some homemade gravlax might be good. That's definitely a 5-star pizza! What a lovely brunch!! I would happily have this on the weekend. "Wretched excess" is such a perfect description of this glorious-looking brunch! Definitely needs a glass of something chilled and bubbly. I can hardly control myself looking at this picture! Smoked salmon and the red caviar are heaven to me...matched w/the eggs and the pita bread...well what's better than heaven?! I use the pocketless pita bread all the time too for pizza crusts, they are wonderfully sturdy to toppings, etc! Happy Sunday Mary! I am really curious about how this would taste, but it looks delicious! I am huge fan of smoked salmon, and I think that seals the deal for me :) Thanks for another awesome post, Mary! That sounds very different, but good! I haven't seen a pizza like this before Mary, it looks beautiful, and I love the ingredients!!! Hope you're having a beautiful Sunday! What an interesting combination! I, for one, have not tried caviar before, and I'm not sure whether I'll like it, maybe yes, maybe no. I'll just have to try it one day! Really inetersting idea,have to try one day! I usually have a lox & cream cheese bagel for breakfast at least once a week. I think this pizza would be a great afternoon substitute. It looks realy good! for me, this would be great at anytime of the day! Brunch? This will be our Sunday dinner tonight. I can't think of anything that would go better on a grey and rainy evening - we are just about fed up with soup! 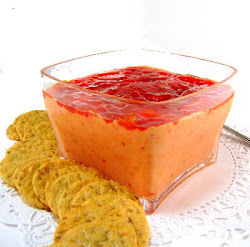 I love the combination of caviar and salmon.... would love to try this with my mom! Only you, Mary, only you! This looks like the best brunch food ever! I am such a sucker for smoked salmon...and caviar...so good. Beautiful and so decadent! The perfect dish for an elegant Sunday brunch. Thanks for sharing this fabulous recipe Mary! 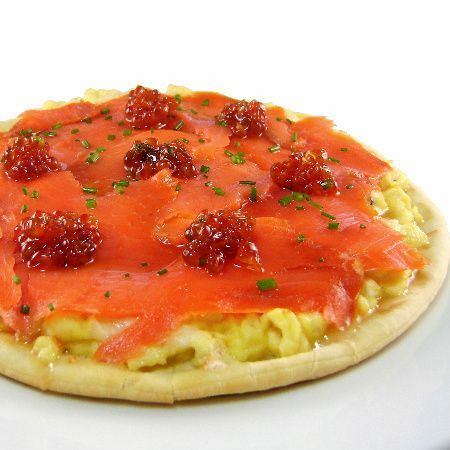 Lovely pizza, love the combination of salmon,egg and red caviar, simply interesting.. The smooth peachy color of the smoked salmon is just divine! That is just gorgeous, I am not sure I could eat it, not a fan of Caviar! but it looks yummy anyway! I love pizza for breakfast, but this doesn't look like any breakfast pizza I've ever had! It looks so delicious, Mary. I hope you are having a beautiful Sunday. Un desayuno estupendo, Mary. La pizza se ve sencillamente exquisita. Mary...thank you for visiting my blog (Cupcakes and Beer)the other day. I love your blog! It is so beautifully done. I look forward to trying some of your recipes and have started making a list of ones I want to try. Whoa! This pozza is absolutely out of this world!! Mary, this is such a high-end recipe and just right for a recipe for savvy New Yorkers! (I am a born and bred NY'er, but I don't think I was ever savvy! LOL!) Seriously, it is very impressive. Hmmmmm what if you like overcooked eggs? What a delicious brekkie combo that calls for a crystal mimosa to go with it. Eat your heart of D. Trump! I would have never thought about scrambled eggs on pizza... I'm very intrigued :) Would love to have a slice right now! Oh yum that sounds and looks so good. Now that's what I am talking about! Red caviar and smoked salmon are my two favorites (being from the old country and all) ;). This is a perfect combo for breakfast! Wow!! pizza looks delicious and perfect.. would love to try this..
super indulgence in a pizza. love to have this as a breakfast. I am not creative enough to make this kind of pizza so I'm very admire of your creativity with food! I haven't had breakfast yet and would love to start my day with with smoked salmon and scrambled egg pizza, who wouldn't?